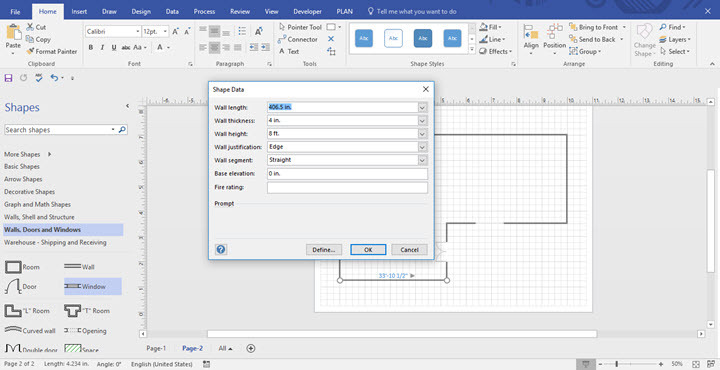 Take a blank Visio Page. 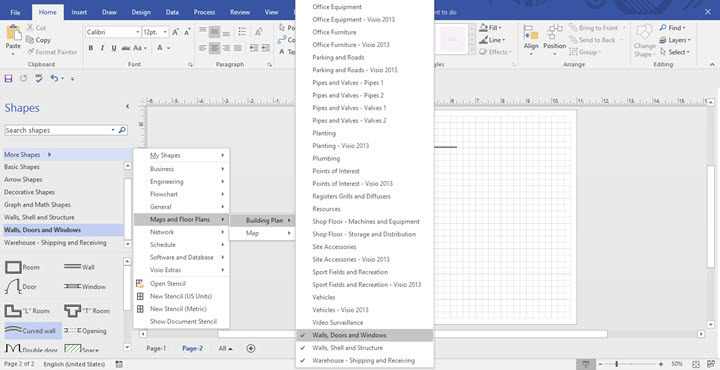 Go to More Shapes –> Maps & Floor Plans –> Building Plan –> Walls, Door & Windows. Drag the wall to the page and extend it till you need it. Connect the wall as you need it. Drag the door and leave it on the wall where you want to place it. You can do the same with double door, opening and windows. To make the work easier, Insert the picture of the plan you want to draw and position it on the page. Start drawing over it. After completing, remove the background. The floor plan is done. You can glue to geometry if any of the wall is not connected properly. If you want to adjust the thickness, height, length or elevation, then select the wall right click on the properties. A shape Data window will appear. There you can fill manually and adjust.